From Jim Henson’s classic television show to the comic series, The Storyteller and his faithful dog have delighted and thrilled us with myths, legends, and stories from all over the world. 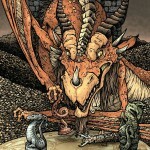 Last year, Archaia, an imprint of award-winning publisher BOOM! Studios, teamed up with The Jim Henson Company to explore four different stories about powerful witches, both good and evil, from a collection of talented writers and artists. 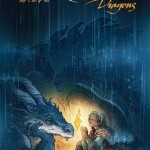 This December, we curl up by the fire once again for the four-issue limited series Jim Henson’s The Storyteller: Dragons. 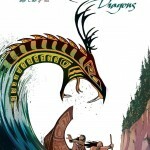 Dragons have taken on many shapes in different cultures, and each issue of Jim Henson’s The Storyteller: Dragons will feature creators exploring these legendary creatures in their own unique styles. In the first issue, Fabian Rangel Jr. (Mouse Guard: Legends of the Guard) and artist Daniel Bayliss (Translucid) bring us “Son of the Serpent,” inspired by Native American stories about the Horned Snake and the Thunderbird. Then newcomer Nathan Pride revisits the classic Celtic tale of the Lambton Worm, while Hannah Christenson (Mouse Guard: Legends of the Guard) presents a gender-swapped retelling of the Russian folktale following a knight and her squire whom challenge the three-headed dragon, Tugarin. Finally, Russ Manning Most Promising Newcomer Award-winner Jorge Corona (We Are Robin, Feathers) presents his take on the Japanese legend of a young girl facing the dragon Yofune Nushi. 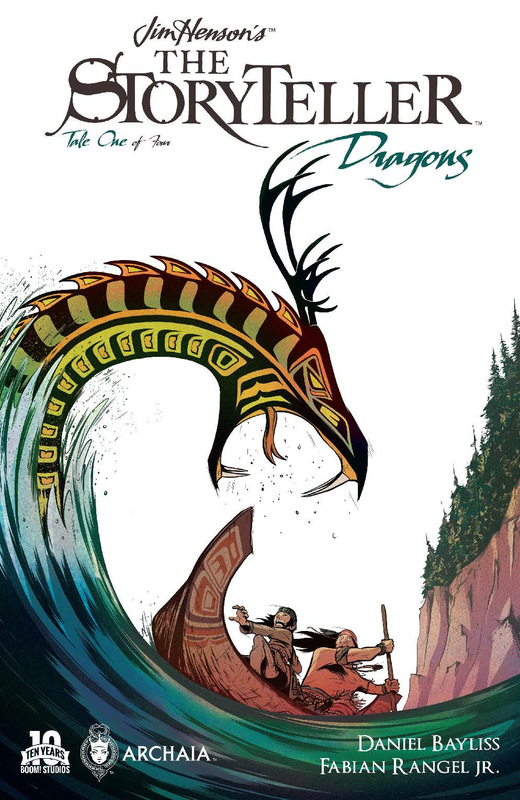 Jim Henson’s The Storyteller: Dragons #1 arrives in comic shops from Archaia on December 2nd with a main cover by Daniel Bayliss for the price of $3.99 under Diamond order code OCT151197. 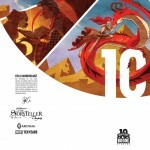 Also available in limited quantities is a Jackpot incentive cover by Cory Godbey (Mouse Guard: Legends of the Guard), a 10 Years incentive cover by Kyla Vanderklugt (Toil and Trouble), and a retailer incentive cover by David Petersen (Mouse Guard). Subsequent issues will be released on a monthly basis thereafter. The Final Order Cutoff deadline for comic shop retailers is November 9th. Not sure where to find your nearest one? Use comicshoplocator.com or findacomicshop.com! Founded by Ross Richie in 2005, Diamond Gem Award-winning “Best Publisher” BOOM! Studios (boom-studios.com) generates New York Times best-selling Eisner and Harvey Award-winning comic books and graphic novels. BOOM! Studios is comprised of four distinct imprints: the “Studios” imprint is home to The Woods, Grant Morrison’s Klaus, and Big Trouble in Little China; imprint “BOOM! Box” publishes Lumberjanes, Steve Jackson Games’ Munchkin, and Giant Days; All-Ages imprint “KaBOOM!” publishes Charles Schulz’ Peanuts; Jim Davis’ Garfield; and Cartoon Network’s Adventure Time. And the “Archaia” imprint is home to Mouse Guard, Cow Boy, and numerous Jim Henson Company properties. Since 2013, BOOM! Studios has had a unique first-look feature film relationship with 20th Century Fox and since August 2014 BOOM! has had a similar first-look relationship with Fox’ television studio to develop properties for the small screen. The Jim Henson Company has remained an established leader in family entertainment for 60 years and is recognized worldwide as an innovator in puppetry, animatronics and digital animation. Best known as creators of the world famous Muppets, Henson has received over 50 Emmy Awards and nine Grammy Awards. Recent credits include the Emmy®-nominated Sid the Science Kid, Dinosaur Train, and Pajanimals, as well as the CG-animated preschool series Doozers and the upcoming Netflix series for young preschoolers Word Party. Features include Alexander and the Terrible, Horrible, No Good, Very Bad Day, as well as The Dark Crystal, Labyrinth, and MirrorMask. Television productions include Fraggle Rock, the sci-fi cult series Farscape, Henson Alternative’s No, You Shut Up! currently airing on Fusion, and the upcoming TV film Jim Henson’s Turkey Hollow, set to premiere on November 21, on Lifetime. With additional locations in New York and London, The Jim Henson Company is headquartered in Los Angeles on the historic Charlie Chaplin lot, complete with soundstage and postproduction facilities. The Company is home to Jim Henson’s Creature Shop™, a pre-eminent character-building and visual effects group with international film, television, theme park and advertising clients, as well as Henson Recording Studios, one of the music industry’s top recording facilities known for its world-class blend of state-of-the-art and vintage equipment. The Company’s Henson Alternative brand is currently touring Puppet-Up! – Uncensored, a live puppet improvisational show.